Akira is the first of my five Furry Babies. A proper BFG – as he’s the size of a small dog, which is not all that usual in cats – Akira is a gorgeous, jet black Bombay cat who sleeps all day and night. Bombays are easy-going softies that require a lot of attention,and are fantastic and loving companions. Their coats are incredibly soft, smooth and glossy, which makes Akira a real show-cat. He is in fact so beautiful that even my friend Matt who is not a proper cat fan said “he’s a real regal looking kitty”. 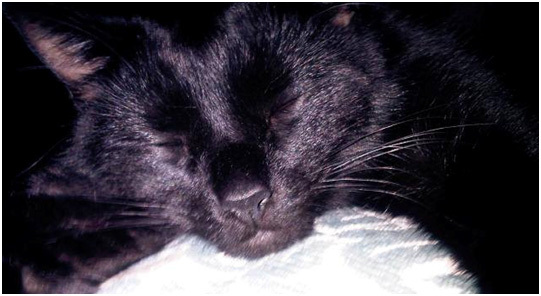 Akira is a very settled cat and mostly keeps out of the way – preferring to lie on the bed and enjoy his own company. He does enjoy getting under my feet first thing in the morning though – particularlywhen I am brushing my teeth. For some weird reason, Akira has a real thing about the bathroom as he also likes to sit on the toilet seat to watch me or Jim the Hubby taking a shower. Akira rarely comes downstairs, except to eat, but every single night without fail I know he will be there to greet me as I get into bed, where he sleeps too – right on thepillow, beside my head. Like parents with children, a cat owner should never admit to having a favourite…but, between you and me, I have a certain soft spot for Akira as I would be lost without him and him without me, or so I believe anyway!